LOS ANGELES -- ABC's "Jimmy Kimmel Live" has a new award to add to its collection: the J.D. Power Award for Most Reliable Midsize Late Night Talk Show With The Same Host for 15 Plus Consecutive Years. 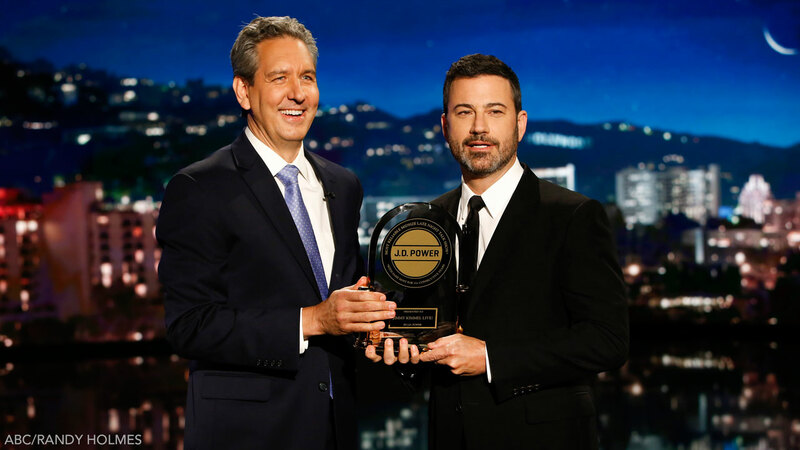 Kimmel accepted the honor Monday evening, making his the first television show in history to receive the coveted J.D. Power Stamp of Reliability. The J.D. Power Award is widely regarded as the gold standard for customer satisfaction and is usually awarded to cars, banks, wireless providers and other consumer products in a variety of industries. "I can't win a J.D. Power Award because I'm not an SUV? I thought this was America!" Kimmel quipped on the show Monday night, explaining that he arranged a meeting with J.D. Power CEO Dave Habiger to discuss the possibility of winning an award. J.D. Power then sent two data scientists to the "Kimmel" set to "see if we measure up to the J.D. Power standard of excellence," Kimmel joked. They found that Kimmel's customers were truly satisfied, and Habiger honored Kimmel on the show.